I'm super excited to join up with Rachael at Sweet Sweet Primary for her summer book study! The book we will be using is Michael Matera's Explore Like a Pirate, which is FREE if you have Kindle Unlimited! I enjoyed reading Teach Like a Pirate, and I LOVED Learn Like a Pirate, so I know reading this book will definitely be a worthwhile experience. Make sure to check back every Tuesday as we dive into a different chapter! This week, we are focusing on Chapter One, which basically gives you an overview of what the book will be about. Gamification, or game-based learning, is exactly what it sounds like- tapping into our students' love of all kinds of games and gamer "culture" to make our lessons more engaging. With my students constantly begging to use Minecraft or Poptropica, this is definitely an avenue of education that I need to explore! 1. 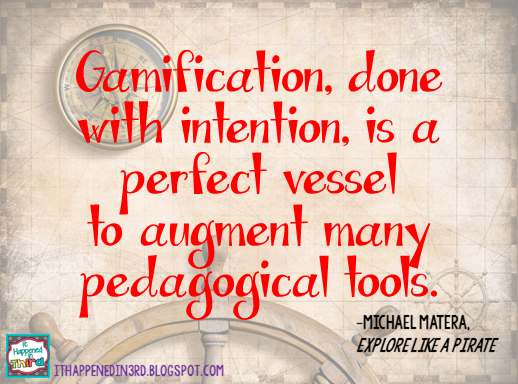 "Gamification, done with intention, is a perfect vessel to augment many pedagogical tools." Now, I'm very close to summer break and that's a lot of big words, but what I think Matera is trying to say is that game-based learning is a great way to support the things you are already doing in class, and it works best when you plan how you will use it for a lesson/unit. I appreciate this statement because it shows that the rest of the book will not be about throwing out my whole curriculum and starting from scratch, but taking what I already know works and tweaking it a little bit to latch on to my students' excitement surrounding games. I also take from this that no matter your personal teaching style, you can probably come up with a way to "gamify" some of your lessons. 2. 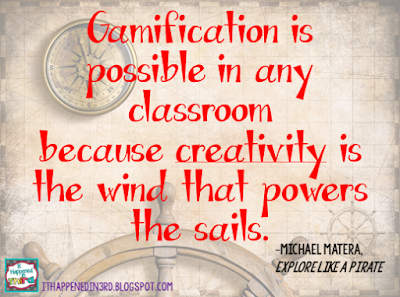 "Gamification provides an environment that awakens the dormant explorer inside each one of us...instead of being a captive audience your students will be captivated by the adventure of learning." Sounds great, right? I know that one of things I planned to reflect on this summer was having the students show more intellectual curiosity on their own, without feeling like I was pulling teeth. In fact, many times over the year I thought, "If only they showed the same amount of perseverance for my lessons as they do this game they are playing on the computer." Hopefully, the rest of the book will give me ideas for how to transfer everyone's willingness to problem solve to get to the next level in a game to their reading and writing! 3. 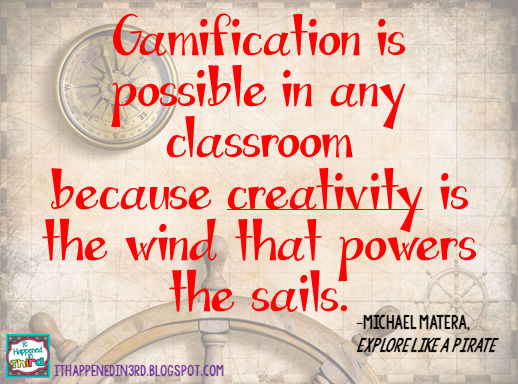 "Gamification is possible in any classroom because creativity is the wind that powers the sails." In our TESTTESTTEST society, creativity is often the first thing to get pushed out of the room. I think it's time to bring some of that back into my class, and am looking forward to the ideas Matera has to develop "confidence, focus, resilience, dependability, curiosity, and empathy" in my students. Maybe these aren't skills found on a test, but they sure are things you need to be a decent human being! I'm certainly intrigued after reading the first chapter, and can't wait to see what next week has in store! Be sure to visit Sweet Sweet Primary to see everyone else's reflections on Chapter One! More great strategies are coming in this book! Thanks for linking up! Thanks for hosting! This is a fun book study! Something that stood out as a positive was that we're adding to our lessons instead of throwing out our curriculum. I got the same thing from that chapter, and thank goodness because I would hate starting from scratch after all the work I've put into the curriculum the past few years! I'm looking forward to reading your ideas and take aways! I love that idea, too! There's nothing worse than being told to start over AGAIN. Can't wait to see what else is in store! I am loving reading this book AND finding some great blogs I hadn't read before! 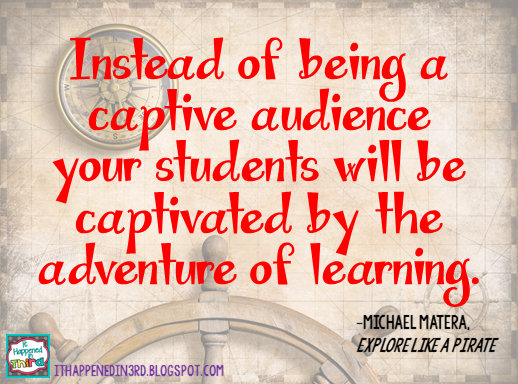 I am definitely excited to bring more engagement to the classroom. Thanks for visiting! That's my favorite part of link ups...finding new blogs! Thank you, I'm glad you stopped by! Looking forward to the rest of the book!